On Sunday, September 28, 2014, Rev. Tony Ponticello addressed the congregation at the Community Miracles Center in San Francisco, CA. What follows is a lightly edited transcription of that lecture. The name of my lecture today is "Reasonable" and I will get into that in just a minute. However, before I do that, Jon Marc Hammer*1 is doing a workshop here this weekend, so I know we've got a number of new people here today. I'd like to explain an important thing about my name. I want to clear this up. My name actually is "Reverend Tony Ponticello." "Reverend" is not a title. It is my name. I changed my name. That is my name now. That's how the IRS knows me. That's how the Social Security system knows me. That's what's on my driver's license. That is my name. I know that sounds a little weird. There's a whole story that goes with that. I could give the whole story about why and how that all happened, but it happened and that's not the sermon for today. It's like a spiritual name for me. I'm sure you know how some people change their name to some spiritual Hindu name, possibly. Well, I didn't do that. I changed my name to "Reverend Tony" because it constantly reminds me what I'm about. I am a minister of God, as A Course In Miracles teaches us, and so I feel fine about my new name. It's great that I have a continual reminder every time I sign a check, that I am a minister of God. Jon Marc Hammer is doing a workshop here over the weekend and Reverend Heather*2 is very fond of playing Jon Marc Hammer audios in the office. In one of the audios I heard recently, he said something that got my attention. I don't remember the exact words that he spoke, but it was something to the effect that if you're not riling people, or upsetting people, you're probably not doing too much. If you're really living life and confronting your own issues, the people that you interact with are probably being bugged a little bit. I think that's true, and it was a nice thought for me to rest with. It's good for me as a minister too. If I'm not riling people up, if I'm just telling everybody exactly what they think they already know and it's all just "good" and everybody politely nods, I'm not doing anything. I'm not only not doing anything for them, I'm not doing anything for myself either. I'm probably not challenging any of my own beliefs. So I want to challenge my own beliefs, and I want to challenge everybody else's beliefs. If some of what I say today riles you up, that's a really good thing. That was my intent. I've been studying A Course In Miracles for 34 years. That's a long time. You do begin to think differently after a while. After 34 years I actually realize how differently I think. Sometimes I'll have flashes of what "reality" was like before I started studying A Course In Miracles. In those moments realize how much fear I lived with all the time. I was afraid of a lot of things. I managed it, sometimes not that well, but I managed it. It was a continual back drop of my existence and now, pretty much, that's gone. I won't say it is totally gone, but it's largely gone. I realize that I think very differently now. And if you truly want to get confronted with how differently you think – start dating. I started dating some new people recently. Of course, when I date, I'm not dating A Course In Miracles people. I'm dating people who aren't A Course In Miracles people, and I see how truly hard it is, sometimes, to simply find some common ground. It's an interesting challenge. I like that. I'm aware of how differently I think. The Community Miracles Center is putting on a big A Course In Miracles conference in April in New York City, and, as I said earlier, my name is Reverend Tony Ponticello so I am also currently aware how I am perceived out there in the greater ACIM community. It's interesting to me. I think I can confidently say that most of the other presenters, and people in the Miracles community, like me. I'm a likable fellow. I think that's great. I'll give myself a big thumbs up on that one. I like being liked. I'm a nice guy. They all think I'm a nice guy. They don't necessarily think I'm very profound though. If people were going to make lists of the profound A Course In Miracles teachers, Reverend Tony is never going to be on that list. They always list other ACIM teachers. Most ACIM students just think I'm a nice guy, not that profound or enlightened. I'm a nice guy though. They like me. They all think I'm a good organizer. That's a really good thing. And I'm a good businessman. That's a good one too. I like all of those things, but I find this all amusing when you relate closely with people, you just get a sense of what they think about you. Whether it's dating or organizing an A Course In Miracles conference. You see, I've been studying ACIM for 34 years and I'm sensitive to energies. I get intuitive feelings, and it's easy for me to read other people's energy sometimes. I get a sense of all that. So, I just want to ask all of you to be truly open minded today about me. Even those who think they know me really well, maybe you could let that go, just a hair. For those of you who don't know me all that well, you are at the advantage. All you need to do is to be open to Reverend Tony, that weird guy who changed his name to "Reverend." You don't know what to expect! Okay. So now I want to talk about reason and logic. In the usual world's definitions, reason and logic are always intertwined. If you look up the definition of "reason," it uses the word "logic," and so it's all about thinking. 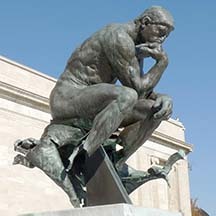 That's why Rodin's "The Thinker" is on the cover of your program (and of this issue of *Miracles Monthly*). I looked up the definition of "reason." The dictionary states "… the power of the mind to think, understand, and form judgments by a process of logic." Okay. Let me repeat that, "... the power of the mind to think, understand and form judgments by a process of logic." That's what the dictionary says. However, if you look at the third definition in the dictionary, and one I looked at early this morning, it says, " ... one's reason means one's sanity: ‘she is in danger of losing her reason.'" In other words, reason also means sanity, and I think that's how A Course In Miracles generally uses the word. When ACIM talks about reason, it's really talking about sanity. It's not necessarily talking about logic. Actually ACIM tells us that insanity can be quite logical. You can, quite logically, have a whole train of thought – thoughts that form naturally one after another – that make sense to be put together, but if it's based on an insane premise, it's insane logic. But it's logical. We get deluded by logic. We see a logical argument, so we think it must be reasonable. But it's not necessarily so. I think this is a very important thing for ACIM students to understand, logic isn't necessarily reasonable. Just because something is logical, doesn't make it true. If it's based on an insane premise it is not true. It's thoughts may follow one after another in a logical progression, but that doesn't mean anything. A Course In Miracles talks about reason a lot. It's all over the Course. I'm going to give you a couple of quotations. It says, "The introduction of reason into the ego's thought system is the beginning of its undoing. For reason and the ego are contradictory." (OrEd.Tx.22.29) When we introduce sanity to the ego's thought system, it undoes the ego. Here's another one, "You are your brother's savior. He is yours. Reason speaks happily indeed of this." (OrEd.Tx.21.67) We are all saviors to each other. You're my savior; I'm your savior. We're all each other's savior, because we're all one and joined. And reason/sanity will always tell us this. There's another one, "Reason, like love, would reassure you and seeks not to frighten you." (OrEd.Tx.21.65) Reason always is reassuring. It's never frightening. Logic, actually, can be quite frightening. You can come to some logical conclusions that are quite frightening. There's a terrible mess going on in the Middle East right now. We've got these Islamic fundamentalists, extremists, and they're beheading people. They're beheading Americans, and they're drawing us into another war. It all looks like another breeding ground for an al-Qaida like organization with possible attacks on the USA. The Islamic fundamentalists have actually issued an ultimatum that people should randomly kill anybody who supports any country that's meddling in the Middle East, which means the United States. Now we apply logic, our president Barack Obama follows logic. We have to do something to counteract this terrible "threat" and now we are getting involved militarily and it's all logical. It logically leads to war. It's not only logical, it's also truly scary. The prospect is frightening. Logic can be frightening, but reason is never frightening. Let's have one more quotation about reason, "You are responsible for how he sees himself. And reason tells you it is given you to change his whole mind, which is one with you, in just an instant." (OrEd.Tx.21.65) I think that's an amazing statement. I am responsible for how you see yourself? And reason/sanity tells me I can change your mind in an instant. Wow, that sounds real codependent to me, but it's an amazing statement. It's reasonable; it's sane. We're all one mind. The sane premise is that there is only one of us here. Then there's only one mind. If I change my mind, you've got to change because it's the same mind. See, that's reasonable. But if I think we're different, then I can never change you, because we're different. We'll that's logical, but it's based on an insane premise, so it's not reasonable. Okay, that's the theory. I remember when this was first becoming real for me. As I said, I started studying the A Course In Miracles 34 years ago. I like to say I was just a toddler at the time. No, I was a young man in San Francisco. At that time I was new in the city and I thought, logically, that I had a limited life. I thought like most of us think, like a lot of society thinks. I would live maybe 70 years. Who knows? I don't know. I think at that time I thought it was 60 years. Now I'm 62 so it must have been 70 years. Logically, from that premise, since you have a limited amount of time for life, to the best of your ability you should do those things you like to do. Because, you see, life is limited. So spend as much time as you can doing what you like to do. At that time, I really liked laying in the sun and working on my tan. I just really liked that. I thought it was very appealing, and I thought it was healthy. There was the problem of the occasional sunburn you had to watch out for but, pretty much, it was healthy. It was wonderful. It was relaxing, and I spent a lot of time doing that in my early 30s; 30, 31, 32. I would go out to the ocean and do that if I could, but I lived right next to Dolores Park*3 which is this amazing place where people like to lay in the sun. It was less than five minutes from my house. I could go lay in the sun at Dolores Park in the middle of the day. I worked as a waiter; I worked in the evenings. I had a number of days free and I could, if it was sunny, lay in the sun in the middle of the day which in San Francisco you can sometimes do in the middle of December! And if you would have asked me, at that time, if I liked doing this, I would have said, "Yeah, I love laying in the sun!" I thought I did. Well, what I realize now, is it was incredibly boring. And I don't mean it would be boring for me to do this now. It was boring when I did it then. It was really boring because I remember I was always thinking, "What can I do to entertain myself while I'm in the sun tomorrow? Can I read this? No, I read that book yesterday. What music should I bring?" (Audio cassettes and portable Walkman's at that time.) I had to plan to have lots of things to do, because I was tortured by the boredom of just laying there in the sun hour after hour, day after day, week after week. "What can I bring? What music? What reading?" We didn't have cell phones in those days, no smart phones. So you truly had to bring paraphernalia to entertain yourself. This was all logical, but it was based on the insane premise that life was limited, and time was limited. When A Course In Miracles actually started working in my life ... luckily one of the books I brought with me to Dolores Park was ACIM. When ACIM truly started working in my mind, I realized that life isn't limited, that I have infinite life. Time isn't limited. I have all the time that I need, all that I want. I'm manufacturing time. As these thoughts started to permeate my consciousness, suddenly sitting in the sun in the park – why would I do that? Suddenly it just wasn't meaningful for me. As a matter of fact, then all I wanted to do were things that were purposeful and meaningful, not things that I thought I liked. I realized I didn't like it after all, but I thought I did. All my logical thinking changed as I stopped and went with reason instead. As I was saying, I wanted to do something purposeful, something meaningful with my life, instead of things that I had decided I liked. I thought those things had value, however, you have to question value. A Course In Miracles talks about how you have to question all your values. So I questioned the value of laying in the sun, and it really no longer had any value for me. I see that now when I interact with the world. The world is caught up in these things that the world defines are good things to do, or that we think are good things to do. When I talk about this point it always pisses people off. Vacations – people think vacations are really good things. In fact, you should have at least one major vacation a year. Your jobs are set up to give you a vacation week, or two, so you can take one major vacation every year. We assume we're going to take one major vacation a year. I see people torturing themselves over taking vacations. They don't know where to go; they can't really afford it. Then they go someplace and it's stressful, and the travel is stressful, and being there is stressful. If they have been on an exercise program, the exercise program goes out the window while they're on vacation. If they've been moderating their alcohol drinking, they drink too much when they're on vacation. They usually get colds and flu and otherwise sick when they come back from vacation. They're stressed out when they come back from vacation because they've got all this work piled up that they didn't do. It takes them a week to get over their vacation. Why go on them? (laughter) I mean, really? Go on a vacation when you're guided to go on a vacation. However, as a formula, a ritual – every year? Do you actually need to go on a yearly vacation? You don't know where to go. "I went there last year. I didn't have a very good time." It's just insane. It's logical that we should do this based on accepted values and belief in limited time. However, when you don't have the belief in limited time then it all breaks up. I think people should travel whenever the Holy Spirit guides them to travel, when it's appropriate, when it works out. When they're guided to, they should go. But to have a value, a belief system, that vacationing, in and of itself, is a valuable good thing – I think we need to break that up. A Course In Miracles says "To learn this course requires willingness to question every value that you hold. Not one can be kept hidden and obscure but it will jeopardize your learning." (OrEd.Tx.24.2) So if you're really an A Course In Miracles student you are questioning all of these things, all of these values that you have, all of the values that the world seems to reflect to you. You see the reasonable thing, the sane thing, is that we're all the same. We're all the same and every single person has the ability to complete me and make me whole. Every single person can make me feel at peace and make me feel loved. If we came from that, the idea that our brothers and sisters are everywhere, we don't have to seek far from salvation. As I put out there frequently, and I have my whole ministry life, I'm a bisexual guy and I'm also what people define polyamorous. I like to be intimately involved with more than one person in a loving and sexual relationship at the same time. This predates my interest in A Course In Miracles, so I've been this way for decades. But I've always liked this next quotation because when you are polyamorous, and when you are dating, like I said I was, people will ask if I'm in a "committed relationship." I always like that term. They say, "Are you in a committed relationship?" And then I remember this line from A Course In Miracles "Under the Holy Spirit's teaching, all relationships are seen as total commitments, yet they do not conflict with one another in any way." (OrEd.Tx.15.56) I like to answer the question, "Yes. I am totally committed to all my relationships." "Yes ..." they may repeat the question, "... but are you in a "committed relationship?" If you go out there and try to find certain people and then you are going to do certain things with those people, and you're not going to do those things with other people then you've got a problem that will kill you. I'll do this with this person here, and I won't do it with anyone else – then you're making a bargain with your guilt. You're not healing your guilt at all. You're not rising above your guilt. You've formed a special relationship, and you think you need to do this because your guilt is going to kill you if you don't do this. But it won't work because your belief in guilt is reinforced, not healed. What A Course In Miracles says is, you're just insuring that you are going to die. That's what it says. Read the section in the Course that talks about the two pictures and the two frames. It talks about special relationships. It warns us not to get deluded by the frame, the appearance or form, but to look directly at the gift. It's the gift of death. That's what it says. "Look at the picture. Do not let the frame distract you. This gift is given you for your damnation, and if you take it, you will believe that you are damned. ... Death lies in this glittering gift. Let not your gaze dwell on the hypnotic gleaming of the frame. Look at the picture, and realize that death is offered you." (OrEd.Tx.17.35) In fact, death is the gift of the special relationship. Maybe we don't see it because we are not willing to give up special relationships. Perhaps when we truly give up special relationships that's when we'll start raising the dead. When we give up this idea that there are special people out there who are going to complete us in ways that other people won't, we'll finally see the last, overcoming – death! We'll have the "last miracle." When we do that maybe we will start realizing some of those loftier ideas that A Course In Miracles has. Don't believe me. I know Reverend Tony is not profound enough for this kind of teaching. But it's not my teaching, it's A Course In Miracles. Remember it told us this about the special relationship, "Death lies in this glittering gift. Let not your gaze dwell on the hypnotic gleaming of the frame. Look at the picture, and realize that death is offered you." (OrEd.Tx.17.35) This isn't just Reverend Tony spewing off pet ideas because he's trying to justify his particularly "juvenile" lifestyle which is the way a lot of people like to interpret me – and that's fine if people have that interpretation. That's okay. As I said, they don't think of me as the most profound teacher in the world, so it's great. But listen up, that's not why I do it. I do it because I'm trying to save lives! I do it because I'm trying to save my life and I do it because I'm trying to save your lives. The Course is very clear. Our special relationships are our death. I keep coming back to this teaching, because it's reasonable. It's sane. It's reasonable because special relationships are based on the fact that we're not one and whole. Special relationships are based on the fact that we are separate and different. If you value special relationships you're only reinforcing the idea that we're separate and different – and separate and different dies! What doesn't die is Oneness, Wholeness and holy relationships. That's reasonable. That's also logical. So I'm always asking people to choose life. Choose a miracle. Choose Holiness. Choose holy relationships. Be reasonable. Be the miracle worker that A Course In Miracles is asking us to be. Realize the promise of the Course, a life without death. And you are never going to do it while you hold on to your special relationships. Rev. Tony is the Executive Minister of the Community Miracles Center and President of the CMC's Board of Directors. He was the CMC's 20th minister ordained by the CMC on October 17, 1997. *1 Jon Marc Hammer is the channel who scribed The Way of Mastery series. *2 Rev. Heather Holmes is the Assistant Minister of the Community Miracles Center. *3 Dolores Park is an inner San Francisco city park where many civic events take place. This article appeared in the October 2014 (Vol. 28 No. 8) issue of Miracles Monthly. Miracles Monthly is published by Community Miracles Center in San Francisco, CA. CMC is supported solely by people just like you who: become CMC Supporting Members, Give Donations and Purchase Books and Products through us.